The best time to visit Mexico is in September, as temperatures cool and the rainy season is subsiding, leaving lush greenery in its wake. September also has fewer crowds, as kids go back to school, and lower prices. Of course, there really is no bad time to visit Mexico, but certain times of the year may appeal to different people more than others, and some destinations and activities may be better at certain times of the year. When planning your trip to Mexico, you'll want to have an idea of the weather, any festivals, and events taking place at the time of your visit, and whether it is the high or low season. Although many people associate Mexico with hot weather, it's a big country with a wide range of climatic zones and conditions. The weather at sea level tends to be warm to hot throughout the year, making for year-round beach weather (how convenient!) whereas at higher elevations in cities like Mexico City, Toluca, or San Cristobal de las Casas, the weather can get chilly to downright cold in the winter months, especially from November through January. Rainy season in central and southern Mexico falls during the summer months, but some areas, particularly in the north along the border with the United States and along the Baja California Peninsula, can go years without rain. Mexico's beach resorts tend to be most pleasant between October and May (June to September can be very hot and humid). You should also keep in mind that hurricane season lasts from June to November. If you'd like to experience one of the many fiestas that take place in Mexico, you should definitely time your trip to coincide with one. Some people dream of participating one of Mexico's unique cultural celebrations like Day of the Dead at the end of October and beginning of November, when cemeteries are filled with people honoring and remembering their deceased loved ones, or the Radish festival in Oaxaca on December 23, when artisans carve and assemble radishes to form elaborate figures and scenes. Or your bucket list may include witnessing natural events like the annual Monarch butterfly migration when you can be surrounded by thousands of fluttering butterflies (November through March), or holding a tiny baby sea turtle to release it into the ocean as part of one of the sea turtle conservancy programs (usually May to November). If you’d like your Mexican vacation to include one of these experiences, you'll want to plan the timing of your trip accordingly. During school holidays at Christmas, Easter, and during the summer months, Mexican families like to travel and you may find buses and hotels are crowded, so keep that in mind when planning your trip to Mexico. Consider Mexico's national holidays so you can keep track of what celebrations are going on and when. Beach destinations may be very crowded during spring break. For fewer crowds and good deals, you should travel at other times or to other destinations. 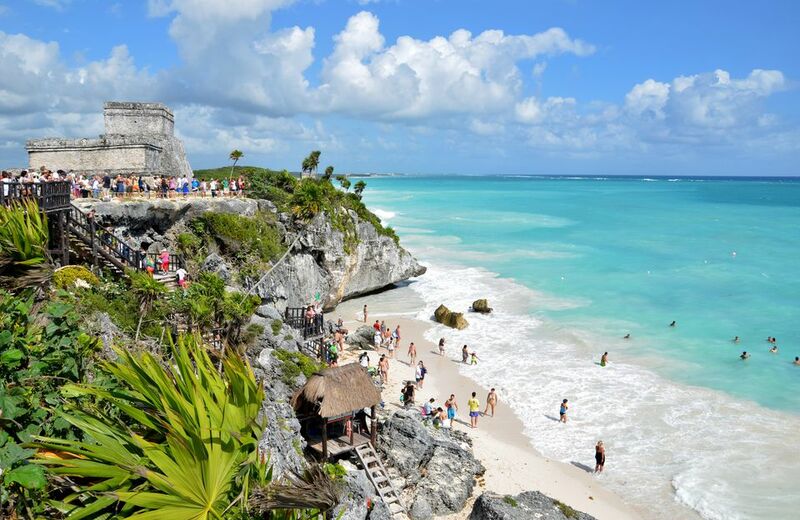 January is part of Mexico's high-season, as those from colder climates flock to the country's beaches. Weather along the coastal areas is pleasant, but at the higher elevations, it can still be chilly. Three Kings Day, held each year in early January, represents the day the Three Wise Men gave gifts to Jesus Christ. This day closes out the Christmas season in Mexico. Like January, February is also a popular time to visit Mexico. It's the country's dryest month and temperatures begin to rise. Día de la Candelaria commemorates Mary's visit to the Temple in Jerusalem after the birth of Christ and is held in early February each year. More than 100 million Monarch butterflies ride out the winter in Mexico each year. The butterfly population is at its peak in February. Spring break typically falls in March, bringing large crowds to the country's coastal areas. While the weather can be nice, if your ideal Mexican vacation involves a secluded beach, don't visit in March. Spring Equinox is an interesting time at Mexico's Chichen Itza ruins, as the interplay of light and shadow makes it appear as if the serpent Kukulcan "descends" the stairs of El Castillo. April is not only hot and dry—it's also crowded. During this month, many Mexicans take their vacations during the Holy Week, flocking to beach resorts and coastal areas. Book your hotels and other reservations well in advance if you're planning a trip during April. Easter in Mexico is a two-week holiday which consists of the Holy Week (Semana Santa) and Pascua (which stars with Easter Sunday and ending the following Saturday). This week is among the most important holiday in Mexico's culture. May is quite warm in Mexico and it also marks the beginning of the country's rainy season, so bring your umbrella. It's also quite a festive month, with many celebrations throughout the country. Cinco de Mayo isn't celebrated as fervently in Mexico as it is the U.S., but many cities and villages will still host small celebrations. Mexico's Labor Day is a national holiday, held on May 1. The weather in June is warm, often with high humidity. If you're coming to Mexico with hopes of releasing sea turtles, the season kicks off in June and runs through October. Feria de San Pedro, or "St. Peter's Fair," takes place in Tlaquepaque near Guadalajara. Día de Locos, or "the Day of the Crazies," is held in San Miguel de Allende. July is usually the wettest month in Mexico, but that shouldn't keep you from visiting: Much of the time, rain usually begins late in the afternoon or evening. Summer vacation has begun so while many tourist areas will be busy, they won't be as crowded as they are during spring break or peak winter months. The Guelaguetza festival is held in Oaxaca for the last half of the month and is a great opportunity to enjoy Mexican culture and folk dances. Northern Mexico is hot during August, while the rest of the country is warm and rainy. Hurricane season officially began in June, but many times, hurricanes hit between August and October. Depending on where in Mexico you're visiting, this is worth considering. At the Huamantla Fair, in Tlaxcala, the city streets are decorated with flower petals and sawdust. The Fiestas de la Vendimia, a wine festival held in Ensenada, Baja California, also takes place in August. September is the beginning of the fall season, a great time to visit Mexico. While the threat of a hurricane is still a possibility, temperatures are cooler and the rainy season is beginning to subside, leaving the country lush and green. Mexican Independence Day takes place September 16, but celebrations are held throughout the month. October is the end of Mexico's rainy season, but the threat of hurricanes still looms large. Weather is cooler though, making this generally a nice time to visit, with few crowds. The Festival Cervantino, held Guanajuato every October, is one of the country's most celebrated cultural festivals. The Morelia International Film Festival takes place in Baja California in October. With cooler temperatures and hurricane season nearly over, November is a great time to explore Mexico's beaches. Temperatures can get much cooler inland (but never bitterly cold). Day of the Dead is celebrated throughout the country, as colorful altars are built to remember the family's deceased loved ones. Puerto Vallarta's annual gourmet festival draws more than 30 chefs from around the world. December is a popular month, as Christmas and the surrounding celebrations are a big deal in Mexico. Outside of the holiday celebrations, many beach destinations and colonial cities are crowded during December. Our Lady of Guadalupe falls on December 12. Posadas (caroling processions) begin on December 16 and run through December 24.